I sometimes think that jazz and poetry is a bit like drinking whiskey and ice cream soda. Both delightful in their own way but as a combo...? There have been exceptions - Ken Rattenbury's interpretation of The Rime of the Ancient Mariner being one and some of Dr. Keith Armstrong's work in this field is also worth mentioning. However, by and large, my preference is for one without the other. Then this came along - 'palm this off on Ann' I thought as I reluctantly put it on the player. 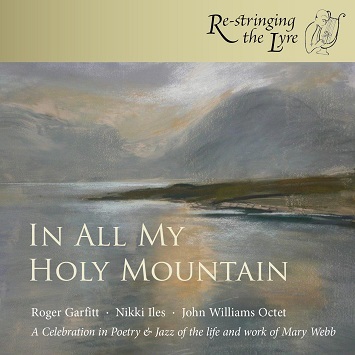 I'd never heard of Mary Webb which maybe isn't surprising as she died in 1927 but, listening to Garfitt reading her poetry, I found beauty in both the spoken word and the effective and compatible musical setting. The music does justice. Supports without intruding whilst providing the poetic, unspoken, sounds of jazz in the solos that pepper the words, the compositions of Iles the emotive voices of the horns, the direction of Williams who commissioned the original work in 1998 and the sympathetic readings by Garfitt make this an original and inspiring work. Available www.restringingthelyre.wordpress.com (£7.50 post free!). Many thanks, Lance, for the excellent review, which has already brought me an order from the States. But I should point out that, as the booklet makes clear, the poems are mine, though I do incorporate a number of Mary Webb's phrases into the second poem, Listening for the Sedge Warbler. Nikki hadn't heard of her either before we started work on the project but came across a couple of her books as she was travelling round and snapped them up. Do give my regards to Keith Armstrong next time you see him. Every good wish, Roger Garfitt.